Born in Italy in 1885, Vincenzo had come to the United States and soon married Anna, an Irish girl who was disowned by her parents because of that marriage. In those days, “good” Irish Catholics didn’t intermarry, especially Italians. Even though they were both immigrants and both lifelong Catholics; it was a cultural taboo. Anna’s defiance meant she never saw her family again. My husband and I know so little about Vincenzo (he went by his middle name, James). He was a barber and there were whispers of him being a “numbers runner” for the mob. To this very day, I’m not sure what a “numbers runner” is. But the hushed tones in which family members used to describe him, I knew it must be bad. With his barber profession, he made very little money. He cut his children’s hair and later his grandsons’. No one seemed to knew him; he was a very guarded, distrustful man. Now, there is no one left to answer questions about his life. The story of Vincenzo James Barberio came to light again as my husband and I began to assist a local librarian with a project to remember World War I. November 11, 1918 will be the centennial of the armistice to end the hostilities in that horrible war; the librarian wants to have the library display to honor that day, and my husband and I volunteered to assist. In the process of doing research on the war and how it affected local lives, we discovered something hitherto unknown by any of us about Vincenzo. Angie Bates, the librarian, was reading, All Quiet On The Western Front; a book that is required for all high school seniors in our city. In the shower the next day, it hit her. 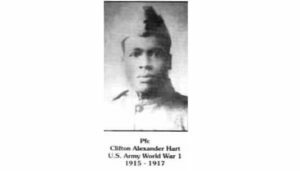 “I’ve got to do something to honor the Veterans of WWI.” Like other cities and towns in the South, Henderson, North Carolina people seem to be interested in the Civil War (the war between the states-as it is referred to here) and in World War II. The veterans of the “war to end all wars” are mostly forgotten today. Angie thought she could find the names of people who served in the war from within the county where she works and honor them. 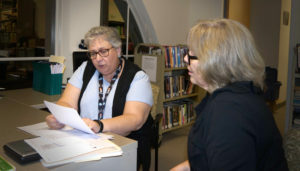 The project took a turn when she decided to put together a temporary museum within the library to display the artifacts that she would assemble in her pursuit of this goal. It is continuing to expand to include a “Preservation Day” for the citizens of Henderson and Vance County can bring mementos, photos, diaries, etc. they may have inherited from members of their families who served in the war. 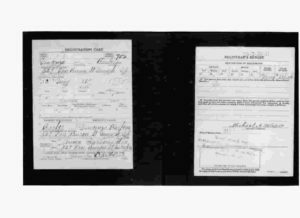 Those artifacts can be photographed, scanned or copied into the library’s archives. Ultimately, they may wind up in the National Archives or the Library of Congress and the National Archives. Another revelation occurred to Angie. She remembered hearing that different communities have what is called “Community Reads”. She now wants to invite “Community Reads” to Vance County to have the group discuss the book, All Quiet on The Western Front. The project continues to grow. The project’s possibilities are endless. 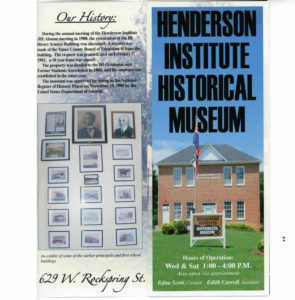 Last Saturday, my husband, Russ, and I visited the Henderson Institute Museum which showcases the historic school for blacks. Luckily, museum curator, Edna Scott, had not yet left. When we told her about the project, she so excited. There are untold heroes of all wars who attended the Institute; and since the sc hool was founded in the 1890’s and closed in the 1970’s, there will certainly be veterans from WWI. Our vet from the newspaper was probably one of them. 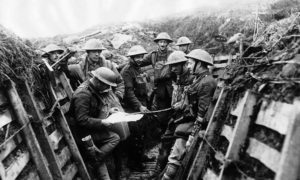 The research will continue and lead us to another path – the role of American Blacks in World War I. How the rabbit plays a part…. As we got more acquainted with Angie in her office, she told us the story of her own grandfather who was in WWI. At her graduation from high school, she was given his inscribed Testament. It was in his possession when he went to war. 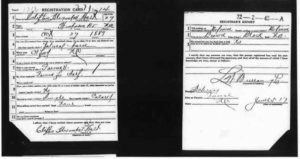 To our knowledge, my husband and I thought neither one of us had a relative who participated in WWI. When we got home we looked up records on the internet. We found a Vincenzo but not a James Barberio. Further investigation revealed that his name of Vincenzo James. His registration for the draft stated his address which was somewhat familiar. We weren’t sure that this was the grandfather who cooked his son’s pet rabbit because it was a different first name. We cross referenced the address with a telephone directory (on Ancestry.Com) — it was him. We now know that he was listed as registering for the draft; we will search further to see if he went off to be a warrior. There is a possibility that the man that would cook and eat he son’s beloved pet may not have been as insensitive as we all thought. If he had been in the trench warfare of Western Europe, an act such as he did might have seemed more natural to him. Killing a pet may have paled in comparison to making sure his family did not starve. What appeared as an act of cruelty may have been thought of by Vincenzo as an act of kindness. The one we feel most sorry for is Russ’ father. Not because Vincenzo did what he did; but, because Nick could never forgive Vincenzo and he had to live with the pain the rest of his life.